1. PAOIL is non-hygroscopic (does not absorb moisture) therefore there is no risk of moisture contamination. Bulk supplies can be kept on a shelf and only the amount required for a car service removed when needed. This contrasts with the special single use packages needed for PAG and POE based oils to prevent moisture problems. Non-hygroscopicity is especially important in tropical environments where high temperatures and high humidities exist in non-air conditioned workshops. 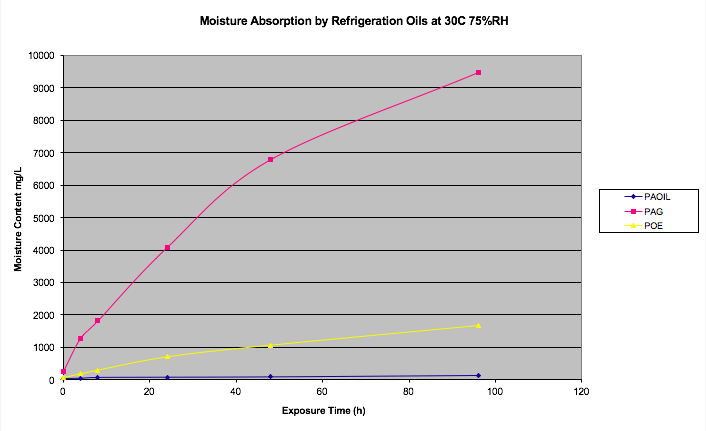 Laboratory measurements of water absorption of PAO, PAG and POE oils at 75% RH and 25 deg C prove the low and slow absorption of moisture by PAO which contrasted with the rapid uptake of water by the other oils. 2. PAOIL is compatible with all other oils and refrigerants, so it is not necessary to flush a system before adding PAOIL, however, it is suggested that for optimum performance you flush your system using PAOIL flush before using PAOIL. 3. PAOIL has a shelf life of 5 years. 4. PAOIL has a low volatility. 5. According to Worksafe Australia criteria, PAOIL is classified "Not Hazardous". It's non-toxic nature is non-threatening to personnel safety. PAOIL also has low flammability - the "flash" point is 250ºC - enabling the product to be handled and transported safely. All of PAOIL's features contribute to the fact that using PAOIL results in increased efficiency and output by customers' machines, along with prolonged system performances. 6. PAOil AA series and Polyluminaa series oils are not hygroscopic and do not need any special precautions to avoid water absorption. Bulk supplies can be kept on a shelf and only the amount required for a car service removed when needed. This contrasts with the special single use packages needed for PAG and POE based oils to prevent moisture problems.